The 20X-NDI Broadcast and Conference Camera, in gray, from PTZOptics, allows you to output up to a 1080p60 signal simultaneously via HDMI, SDI, and NDI or IP outputs (NDI and IP share the same RJ45 port). The NDI protocol, NewTek's innovative IP technology, gives you low-latency access to audio and video devices anywhere on your network for various A/V applications. You won't be restricted to sources connected directly to a single system. The 20X-NDI comes with a NewTek NDI license, so you're set to go right out of the box. The camera also has a composite output that can be used on its own (without any of the other outputs at the same time) to deliver 576i/480i resolution. The 20X-NDI has a 4.4 - 88.5mm lens providing a 20x zoom range which is best used in midsize settings. The NDI versions of the PTZOptics 20x cameras are ideal for streaming applications, houses of worship, sports streaming, live productions and events, and when cable runs might be an issue (when you'd rather run Ethernet cables instead of coax). The camera does well in low-light conditions owing to a fast f/1.8 - 2.8 lens aperture and minimum illumination requirement of only 0.5 lux. On top of this, built-in wide dynamic range and 2D and 3D noise reduction further enhance the broadcast experience. The camera is completely open-source so developers can customize everything as they prefer using simple HTML. The 20X-NDI can be powered over PoE or using the included power supply. It offers RS-232 and RS-485 serial control, an audio line-in for HDMI and NDI/IP streams, and 10 presets via the included IR remote control or 255 via serial or IP control. Note: All the outputs can stream up to 1080p60 simultaneously except for composite. When you use composite, the other outputs turn off. Box Dimensions (LxWxH) 11.35 x 9.35 x 9.25"
20X-NDI Broadcast and Conference Camera (Gray) is rated 4.0 out of 5 by 1. Rated 4 out of 5 by James from PTZOptics Cameras are a Great value, but are Limited in use. The PTZOptics 12x, 20x, 30x, style camera, or, with NDI software is good for any person or organization that wants to Stream Live their events. You will only need the NDI camera software if you are mixing two or more cameras. The quality of the video is very good. You have to insert into the camera a 1/8" male audio plug with a powered microphone, or connect to a audio mixer to have audio embedded into the video for streaming. There are limitations you need to pay attention too. 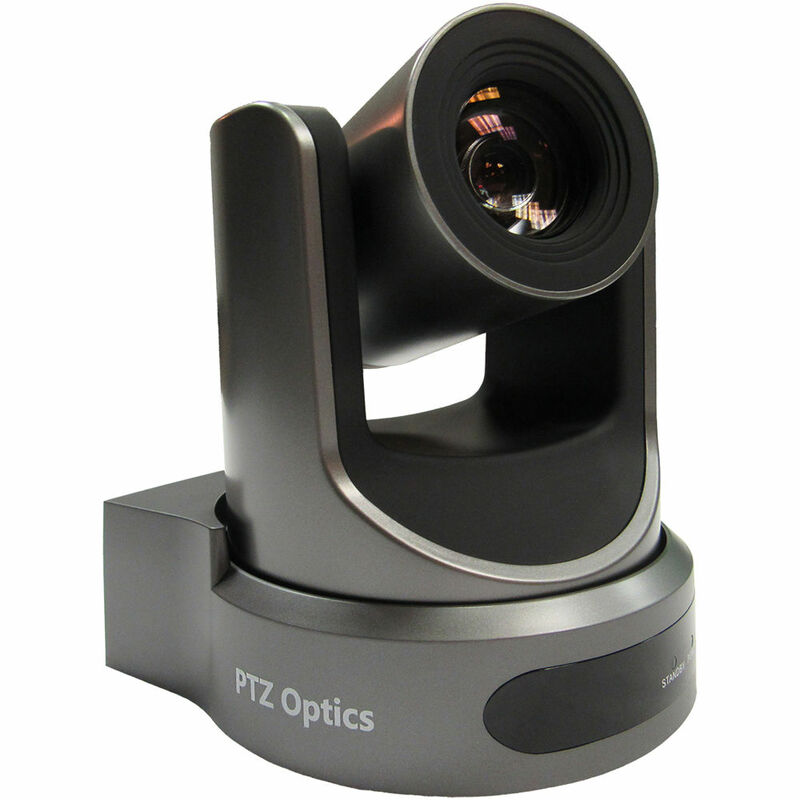 The PTZOptics cameras are 60 or 30 frames per second. Broadcast cameras are 59.94 0r 29.97 frames per second. You cannot mix with broadcast cameras without a frame converter for each camera, and at considerable additional expense. The camera does not have an internal means for recording an event. However, if you are using a Windows OS or Apple OS computer, you can buy or download free software that will record your event. If you are using multiple cameras to stream an event, add NDI to your cameras. You can purchase software for ($995) from Wirecast or other vendors that can be used to record and or stream the event to your CDN provider. At this time you can only record the Program stream out. Again, you have to buy individual recorders for each camera that record 60 or 30 frames per second. Most recorders record 59.94 or 29.97 frames per second, so they are expensive and hard to find. PTZOptics should produce NDI cameras that are rated at 59.94 or 29.97 fps NTSC cameras and SD Card slots. They would sell a lot more cameras. What is the difference between this camera and the NewTek NDIHX-PTZ1 NDI PTZ Camera? Please keep in mind that base PTZOptics models will require a firmware upgrade to add NDI support. This upgrade is available as a secondary SKU you will need to purchase. What sensors do PTZOptics NDI cameras use? Sony, Panasonic, or something else? What size? We use Panasonic CMOS sensors which are very good for low light. They are 1.27 CMOS sensors and there is more information on our data sheets. Do the PTZ NDI Cameras support Power over Ethernet (POE)? Yes, this camera has Power Over Ethernet. The NDI models have the same specifications as the SDI models with NDI firmware and compatibility.